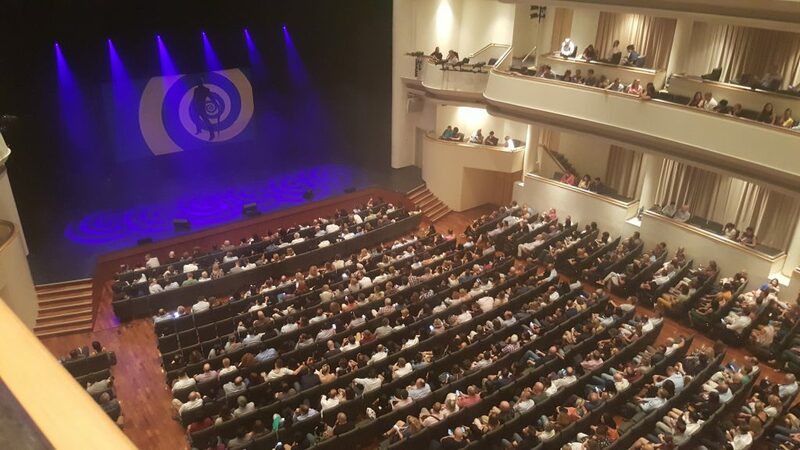 The queen of erstwhile surrealist humour, Eddie Izzard, stopped by Singapore this week to deliver his force majeure stand up show. Starting this particular tour in 2013, one would be led to believe Eddie has this show down to a scientific tee. And he pretty much does. It was only when I got there I realised that I had been to the University Cultural Center on the grounds of NUS (National University of Singapore) a few years ago to see John Cleese. It’s a fine venue if you don’t want a drink before the event as there’s only one bar with one server in the lobby. I had Vietnam-esque flashbacks to Guns N Roses looking at the snake like queue before the show. And you can’t bring drinks into the actual theatre. Izzard starts his show off with some historical observations and surreal anecdotes, often warping historical events with his own unique angle on things. I thought he would have went along on that path throughout and I thought it was a good theme for a show; surrealistic historical anecdotes along a solid timeline. He strays off on to several tangents from then on though and the show feels a little all over the place. Which, I guess, suits Izzard’s style and manic, rambling delivery. But funny? Yes, generally funny with some laugh-out-loud moments sprinkled throughout. It’s also very apparent how his shows would work in French and German which Izzard has performed during this tour. Some clever and witty bits on those languages are tackled here and there. Izzard takes a 10 or so minute break in the middle which leaves little room for thirsty beer hunting patrons to head down and queue yet again for their refreshments. Boo hoo. In the second half Izzard continues where he lets off and seems to “try” new off the cuff rambles (which he drily note several times “Singapore says no”) but again it feels like even those are scripted and clinical due to the knowledge we have that he has being doing this show for coming on 4 years now. Wrapping up, Izzard brings back a few things he mentions at the start of the show to bring a sense of conclusion to proceedings. One thing I felt dragged on for too long was the talking chicken bit. Didn’t work for me. All in all, a funny show with some stand out (up?) highlights throughout but with a bit of a clinical sheen to it. Leaving University Cultural Centre is, of course, a nightmare as it’s nowhere near an MRT show. Lines of people…line…the roads faces blazed from their phone screens trying to snag an Uber or Grab but we manage to entice an Uber from 15 minutes away.